Raised Band: A raised, horizontal band across the spine of a book. Prior to early in the 19th century when books were bound by hand, two or more leather bands were stretched across the spine of a book and a cord was tied to each side of each band. These cords were stretched across the front and back boards and tightly tied to the Foreedge of each board as shown in Figure 20. 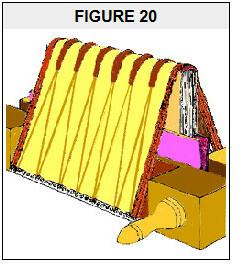 The leather binding was then molded around the raised bands concealing the cords as seen in Figure 15. After this "tying up" period ended with the introduction of Case Binding, the appearance of raised band remained popular and are still used today as a purely decorative device. Reading Copy: A copy of a book in Fair to Poor condition you would buy only for the purpose of reading or using as a reference due to it undesirable condition. If the book in better condition were collectible, and worth the investment, such a book might be a candidate for rebinding. Generally, however, such a book is a sad case of heavy wear, use and abuse which has the single virtue of possessing at least all of its text pages. Rebound: A book that no longer has the original binding or covering from the publisher. Instead the pages have been rebound into a new covering. Recto: The right-hand (front) side of a leaf in a bound book. Also called the Obverse. Release Date: Very similar to the Date of Publication, but implies a more specific date announced in advanced by the publisher when the book will be available for sale. Remainder: When a book is overstocked in the inventory of a publisher, and has ceased to sell, a publisher may depose of the unsold copies by remaindering, i.e. selling them to book distributor or booksellers at a heavy discount which may even be below cost. Also called Publisher�s Overstock. Remainder Mark: Many publishers mark the bottom or top edges of books which they have sold as remainders to identify a book as having been discounted. The marks include lines made with a marker pen, ink stamps, and even speckling with spray paint. Remainder marks destroy a book's collectibility even if it is otherwise in "as new" condition. Reverse: The left-hand (back) side of a Leaf in a bound book. Also called the Verso. Rubbed: Wear or scuffing on some part of a book's Covers, Spine extremes, or edges. The origin of the expression is that the wear is due to the rubbing the book has experienced during frequent re-shelvings, but the expression has been generalize to reference the results rather than the source of rubbing. Rubbing can be light or heavy. At its worse, rubbing may have exposed the cardboard beneath the layer of cloth or paper covering the boards; and the corners may have become rounded. More serious wear (scuffs, scrapes, or similar defects) due to abuse more than use are not properly covered by this term and should be described separately. Ruling: As applied to a decorative element used in a book or on its covers, a straight line printed, Blindstamped, or stamped with gilt or another color. 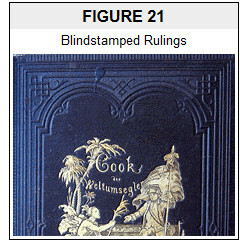 A single ruling creates a line which can be used for demarcating or other purposes; polygonal figures are created using several rulings and are often used to enclose printed or stamped text, such as titles, or to surround illustrative or other decorative devices. See Figure 21.